Dragonflies gathers a gorgeous array of translucent garden critters to beautify your correspondence for birthday, love, wedding, anniversary, friendship, hello, sympathy, congratulations, mother’s day and just-because. This all-occasion Masha D’yans greeting card evokes the dazzling days of summer any time of the year. 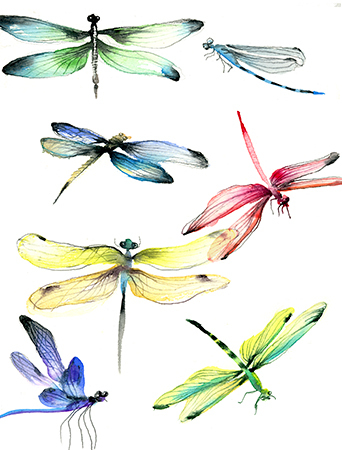 Dragonflies card is offset printed in USA with environmentally-friendly soy inks on luxuriously heavy, bright white matte stock, it measures 4.5×6 inches folded. The interior of this card is blank but features beautiful artwork on the back as well! The card and envelope are protected with a clear cello sleeve.